Getting ready for my annual cookie baking frenzy I got my basket of cookie cutters out and added this year’s little Scottie dog to the group. I love old cookie cutters and I’m always looking for them when I thrift shop. 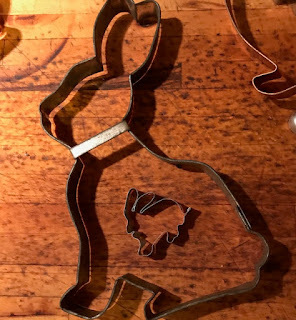 Cookie cutters are still a collectible that most of us can afford to indulge in and I just discovered there are actually cookie cutter collector clubs, who knew? Yes, there are a few that have sold for thousands of dollars, but those are really, really old and incredibly rare and I seriously doubt that I will be running across one in my local Goodwill. That being said, what is the history behind these common and fun household items? Who thought of making a piece of tin into something you could mass produce cookies with? Can you imagine hand cutting all your cookies? Nope. I started down the research rabbit hole because that is inevitably where my curiosity leads me. Halloween is one of our favorite holidays in America, for both kids and grownups. How did it get here and what is the significance of the things we associate with the holiday? Halloween is actually a fairly modern take on an ancient celebration and ritual in the pagan/Celtic world that was called Samhain, pronounced Sah-win. Samhain was celebrated halfway between the autumn equinox and winter solstice, generally October 30 to November 1st (dates were added after calendars came along). It was a time when the veils between the worlds were thinnest and the dead could cross over; it was a time for celebrating a successful harvest and making sacrifices to get through the winter and propitiate the gods for the next year. This was a dark and superstitious world where ritual and offerings to gods and goddesses were important to survival.